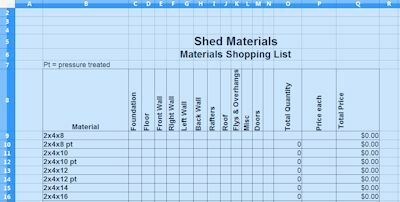 Then, once you have added or completed the materials needed for each section of your shed, the spreadsheet will automatically move the information from each individual section into a summary materials list. A summary list showing all materials needed to build your shed. This summary materials sheet can then be given to your friendly local lumber supply house where a cost estimate can be done for you. If you are building and designing your own shed, you can use this spreadsheet to load all your materials from 2" x 4" studs to bundles of roof shingles. You can even fax the worksheet in to your lumber store if you prefer! Now how simple is that? I know that in many cases, Lowes will have a quote back for you in a couple of hours for your shed building materials costs! I have put together this shed materials estimating spreadsheet to help you in finding out the costs associated with building your storage shed so that you will know up front how much your shed will cost you. I typically fax this materials list to several lumber supply houses, check on their delivery costs, and go with the cheapest materials estimate. If you would like a copy of the materials spreadsheet, please contact me. In the question and comment box, please mention that you would like the 'Shed Materials Spreadsheet' and submit the form and I will email it to you. If you would like to see all the materials lists I have for all the shed plans I sell, you can find them here. Have fun when building your new shed, and as always, be careful when working with and around power tools.